This article covers Exporting and Importing Your Data with the WP Google Maps Pro. This documentation covers WP Google Maps Pro version 7. * and above. For documentation on 6. * and below, please see the legacy documentation. Please see our Importer Demo Page for an example of imported data, and examples of the various formats supported. At present our exporter only supports JSON format exports. If you need to perform a CSV export, please refer to our legacy documentation. You can access the Export panel through Maps → Advanced → Export. From this panel you can pick which maps you would like to include in the exported file, and what data from those maps to include in the exported file. Please click the Export button below to download your data. Please go to Maps → Advanced → Import to import data. From here you can pick a source to import from. You can import from a remote URL, or you can upload a file to import. Click the Import button once you have selected a source. Our remote URL import supports importing Google Spreadsheets, please see our example CSV file for the format your sheet must match to be successfully imported. 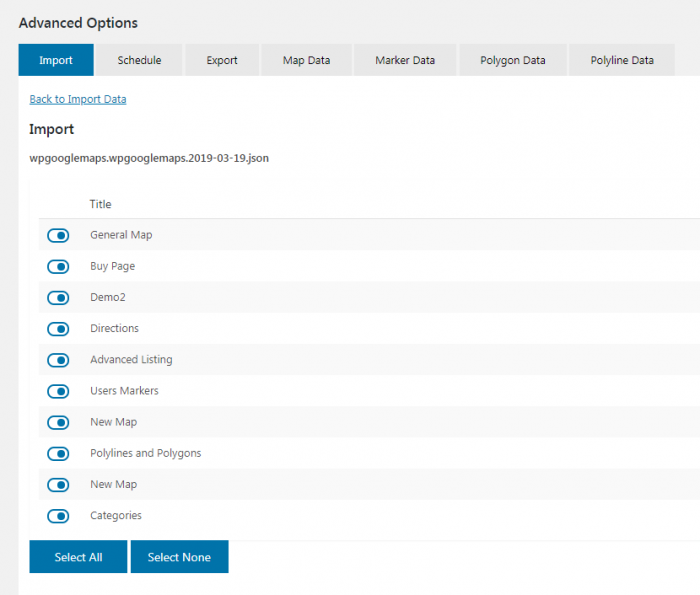 From here you can choose which maps to import from the selected source. Please note that the various options described below are not supported for all sources. 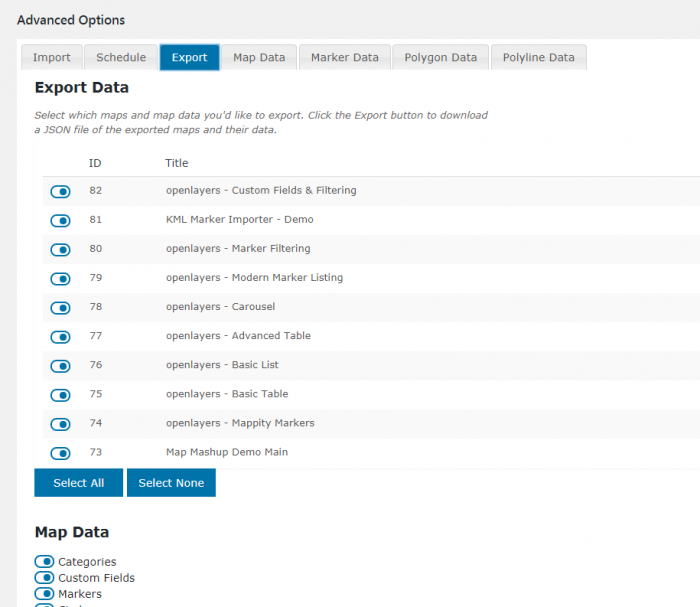 The Map Data panel allows you to choose which elements of the source should be imported. You can use the Find Addresses of Latitude or Longitude when missing setting to geocode addresses or coordinates where needed. If your import source has addresses, but no latitude and longitude coordinates, please use this setting. If your import source has coordinates, but no addresses, you can use this setting to guess the nearest street address when importing data. You can use the Apply import data to setting to import your data to a specified map. Please note that for JSON imports, checking this box will cause map settings in the JSON file to be disregarded. 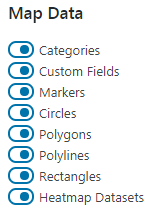 You can use Replace map data to replace the markers, polygons, polylines etc. on the target map. Please note that using Replace map data will delete ALL data on the target map before performing the import. Once the replace operation has been performed, the removed data is not recoverable. Uploaded files are stored in your /wp-uploads folder. You can use the setting Delete import file after import to save space, this is useful for conserving space when you are performing large imports or repeated imports. If you leave this option unchecked, you will be able to import your file from the Import panel without the need to re-upload your file. Our Pro add-on supports Scheduled Imports through the Import panel. This is especially useful when you want to import data from a remote source, where the source data changes periodically. To use this feature, please follow the instructions above on setting up an import. After following these steps, you are presented with a choice of Import, or Schedule. 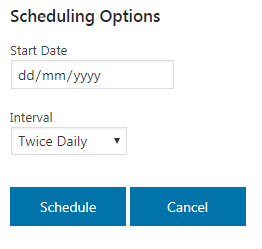 Click Schedule to open up the scheduling options. From here you can choose a start date and interval for your scheduled import to run on. If you need to use an interval which is not specified in the Interval dropdown, please use a third party plugin to alter your sites available cron intervals, or use the cron schedules filter. This covers importing and exporting your data. If you need further assistance, feel free to post on our Support Forums or visit our Support Desk. 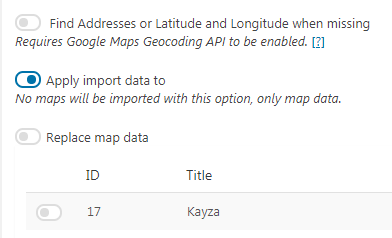 Is there any way to use the address instead of manually inserting geocode? Lots of manual work to do that.